As there are many launchers available in Play Store, some are graphically high and where some are smooth and handy. 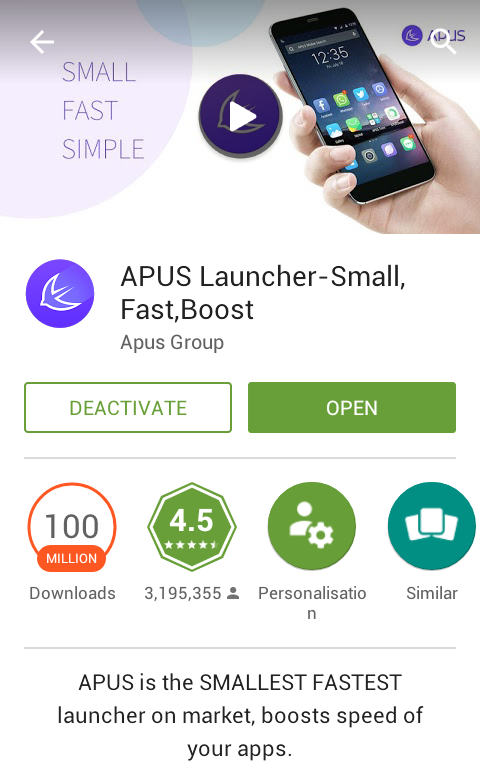 Apus Launcher; one of the best launcher in play store is smooth, light and have user friendly interface. The launcher have combined features from the Blackberry and Iphones' user interface while still some bugs exist. The concept of label wised folder ( collection ) of apps are also included so that all the folders can be accessed by a simple slide. Most of the people use Go Launcher because of many advance features and is the revolutionary app in user interface for android devices. As an app consist of numerous features its size increases which may lead to slow phone processing. A lightly made app with all important features are required and must be used for a better smart phone experience. As for me, I had used Go Launcher many months back, but now using APUS Launcher which is really so smooth and clean designed to make the smart phone smarter. It has brought to the level of simplicity, the app could be developed. CNET says," APUS is dedicated to building the smallest, fastest, simplest user system for Android it can." So far APUS has ranked No. 1 in 30 countries and top 5 in over 50 countries under Personalization Category on Google Play. Techcrunch rates the launcher as the best Launcher for lower-end phones. APUS is sweet, fun and handy to use as it uses about 2 MB RAM. So it gives the best performances on every android phones. Download and enjoy APUS Launcher from Play Store.